We want to make sure you’re able to share your podcast everywhere your audience is. Starting today, that includes sharing episodes directly to Snapchat. 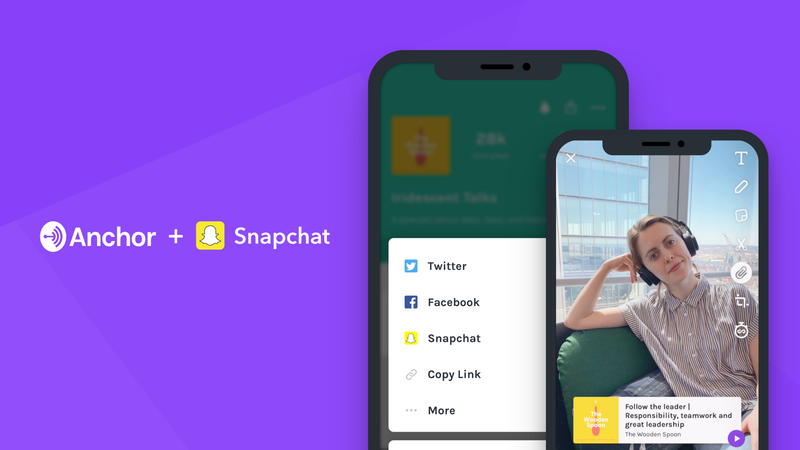 You can now share Anchor podcast episodes and profiles right to a Snapchat story, which will link back directly so anyone who sees your story can immediately listen in their preferred podcast app. Tap “Share” from any episode or profile page, and you’ll see the Snapchat logo come up as one of the sharing options. This will open a new Snapchat story, with a custom sticker and swipe-up feature that deep-links to the podcast. You can add a photo, caption, additional stickers…anything that makes it your own! Once the story is posted, your friends can swipe up and see the option to listen on any platform where your podcast is available. Whatever they choose, the podcast will open right in their selected app. Sharing your episodes everywhere you possibly can is one of the best ways to grow your audience, and we’ll continually add more ways to do so. We can’t wait to see your podcast all over Snapchat! Haven’t started your own podcast yet? Check out our How to Start a Podcast guide for tips and tricks on how to make something awesome with Anchor.